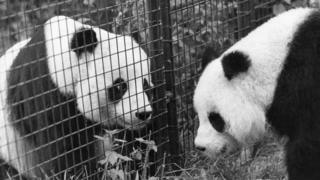 Margaret Thatcher once refused to share a flight to Washington with London Zoo's giant panda, newly-released National Archives' files have revealed. Lord Zuckerman, president of the London Zoological Society, suggested that Chia Chia the panda could share the prime minister's Concorde flight in 1981. Washington's Smithsonian Institution had asked to borrow Chia Chia, to mate it with US-based Ching Ching. But Mrs Thatcher said pandas were not "happy omens" for politicians. The file also showed Mrs Thatcher's initial response. On a briefing note about the idea, she had written in blue felt tip pen: "I am not taking a panda with me". To emphasise her point she underlined the word "not" twice and also underlined the word "me". She then added: "Lord Z knows more about pandas than I do - I am sure he can arrange these things."